When I visited the family in Utah over Labor Day I noticed a preponderance of Obama yard signs, including this one in my parent's yard. 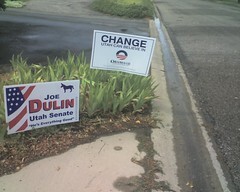 My Dad also noted that the local Democratic Party HQ had "LDS for Obama" pins, which must be some kind of first. There were certainly never any "LDS for Kerry" pins (that I was aware of) four years ago. The Salt Lake Tribune has a county-by-county Obama donation comparison map. I'm from Cache County, the slightly blue county in the north there.